Gigabyte GA-P55-UD5 PCSTATS Review - Gigabyte's Mainstream P55 Express Platform - Worth it? Abstract: Gigabyte's GA-P55-UD5 socket-1156 motherboard is an enthusiast grade Intel P55 Express platform with a ton of extra features packed into it. Along with the obvious support of Intel Core i5 and Core i7 800-series socket 1156 processors, the GA-P55-UD5 board features three physical PCI Express x16 2.0 slots that support both ATI Crossfire and NVIDIA SLI. Gigabyte's Mainstream P55 Express Platform - Worth it? Motherboard's based on Intel's P55 Express chipset are going to run the gamut from inexpensive offerings starting at around $100 up to extreme enthusiast motherboards that will go as high as $400. That's a huge price range to choose from, especially considering that Intel's P55 Express chipset and Core i5 and Core i7 800-series processors ensure that most motherboards will have the same basic performance, as we've seen from benchmarks. So what exactly does that extra bit of cash get you? 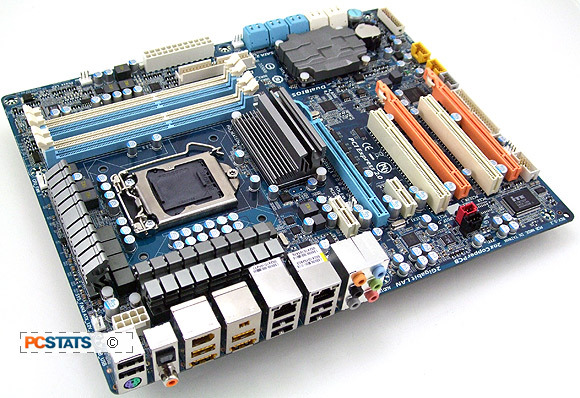 In the case of the $220 CDN ($230 USD, £135 GBP) Gigabyte GA-P55-UD5 motherboard, the answer is more features and better build quality. When compared to the $130 Gigabyte GA-P55-UD3R, the UD5 has support for NVIDIA SLI and more power phases. The most important of these features is NVIDIA SLI support. While NVIDIA's Geforce videocards have been taking a beating in the past few months thanks to ATI's 5000-series of videocards, there are still a lot of people in there who are looking to put in a pair of Geforce vvideocards for parallel processing. Support for SLI means that the Gigabyte GA-P55-UD5 motherboard has that many more options when it comes to system configurations, and as any upgrader should know, options are important! To make support for multiple NVIDIA Geforce videocards in SLI mode (or multiple ATI Radeon videocards in CrossfireX mode), the GA-P55-UD5 also has additional PCI Express slots, so a single videocard can be run with 16x lanes of PCI Express 2.0 bandwidth, or dual videocards can be split that bandwidth into dual PCI Express slots, each with x8 bandwidth. Fortunately even videocards like the Radeon HD 5870 aren't bandwidth bottlenecked by x8 bandwidth, so Gigabyte's GA-P55-UD5 should have a nice lifespan of videocard compatibility. Really, everything else about the Gigabyte GA-P55-UD5 is exactly what you'd want from a motherboard of this class. Fourteen USB ports, 10 SATA ports, and lots of expansion slots mean that this motherboard will have enough room to migrate all your old hardware and room left over for future upgrades. If you're an NVIDIA Geforce owner and you think SLI might be in your future, Gigabyte's GA-P55-UD5 is an excellent choice for a new system that uses a Core i5 or Core i7 800-series processor. Gigabyte's Ultra Durable 3 manufacturing means that build quality is consistently high and performance wise this motherboard is on par with every other motherboard based on the Intel P55 Express chipset. On the overclocking front, PCSTATS was able to push the Gigabyte GA-P55-UD5 motherboard bus speed to 195MHz, not the greatest result PCSTATS has seen from the Intel P55 and Core i7 750 but not too bad. All things considered, Gigabyte's GA-P55-UD5 is a good mainstream motherboard to consider if a Core i5 upgrade is in the books for your next system build. It doesn't have SATAIII or USB3.0, but unless you're on the cutting edge of what's new and plan on buying a couple SSD's this won't matter too much. USB3.0 add-in cards are popping up for reasonable amount, and the GA-P55-UD5 does have two PCI Express x1 expansion slots which you can easily use for that purpose. Recommended. Pg 12. — Gigabyte's Mainstream P55 Express Platform - Worth it?